How to make a platform move left and right constantly — Welcome to the GameSalad forum! i want a platform that simply moves left and right which my player can hop on and and move with it. It also shouldn't affect my players speed since i want it as if the player was still on the floor not moving. Any help would be appreciated. Thanks! look up jamie cross on your web browser. he has a series of good easy to follow video tutes that go through platformer movement, and i am pretty sure there’s l/r movement in there. second rule, if self position x > or = the right end, change self linear velocity x to - the speed. hope that and jamie’s videos help. if you are fairly new to gs, i’d recommend jamie’s videos, and the ones by gshelper on youtube to get your head around a lot of the gs functionality. 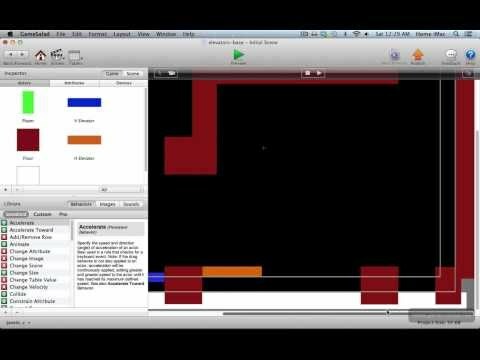 But also make the platform have tons of density, so the player can collide but not move it. Looks good @jamie_c. One question though. If the player touches the side of the elevator, or actually underneath the elevator, I would presume he would "teleport" up a few pixels or more. Of course you could add constains for the x axis as well, but that would not solve the underneath the elevator dilemma right? O actually watched that a long while ago I think when I started Gamesalad. Your videos helped me tremendously with my logic of Gamesalad and also general guidelines. Thanks.